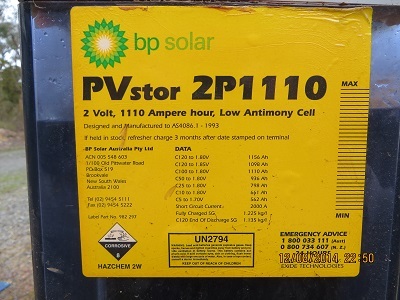 After 11 years our 48 volt battery, the storage for our off-grid solar power system was beginning to show its age. It was commissioned on the 2nd July 2003. We determined some few months ago that we should upgrade during 2014. 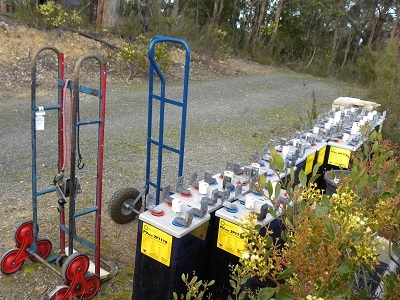 The battery was comprised of 24 two-volt deep-flooded lead acid cells. It has performed exceptionally well: we have never been without power. I have noticed that the capacity of the battery, 1110 amp hours, was beginning to decline and that it was necessary to top up the system using the generator more often during the cloudy weather though July and August. It never died, it just grew old and I shut it down on Tuesday 12th July 2014. I then had to move the 24 cells out of the battery enclosure ready to install a new set of 24 cells which were due to arrive on Wednesday morning soon after 09:45. I was assisted by VK5TW, Trevor, a long-standing friend and my wife, Jenny. After enjoying a barbecue lunch and no alcohol, removing watches and rings and donning our protective gear: steel-capped boots, safety goggles, old clothes and a sturdy heavy plastic apron I went through the shut down procedure at 14:15 hours. Trevor then disconnected each cell and I moved each cell outside, out of the way, so that at the end of the procedure I could clean the enclosure. The whole process took just over two hours. Each cell weighed (with electrolyte in place) 65 kilograms. They are 690mm high, 210 wide and 147 in length. I used a sack trolley and I noticed at the end of the day that I had been working! I had an early night to prepare to do the whole procedure again on Wednesday morning. I probably would have replaced the cells with the same product if still available. Unfortunately the cells, labelled BP and made by Exide, are no longer manufactured. BP in Australia has left the renewable energy market. The down-side of deep-flooded lead acid cells is that they hold plenty of electrolyte (and thus needed infrequent topping up with distilled water), but they are heavy and it is easy to spill the electrolyte as cells are moved. 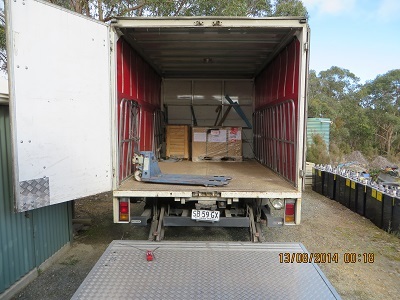 They are ‘dangerous goods’ and new transport regulations apply to moving them on public roads. So on Tuesday night we went back to the ‘dark ages’: we had no power. After considerable research I decided to purchase 24 ‘dryfit Gel’ cells. These are made by Sonnenschein and come from Germany. In these cells the electrolyte is contained within a glass mat. They are nearly maintenance free and they are not classed as ‘dangerous goods’ with respect to transport. 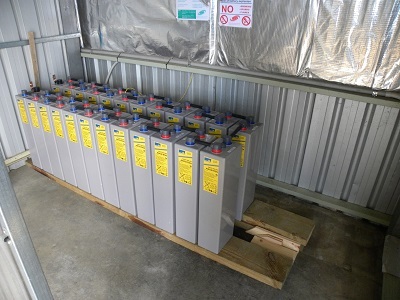 These have a capacity of 850 amp hours, but a better discharge curve compared with standard lead acid batteries. It is a little like comparing the small SLAB batteries we use (or used to use) in our SOTA and Parks activations with LIPO and LifePO4 batteries. The battery arrived on time and with the help of a Country Fire Service colleague, from my days gone by, we took each cell from the pallets and soon had them in place for the electrician to do his work. We used a smaller trolley for this purpose. The new cells are 648mm high, by 147mm and 208 mm and weigh 49 kilograms. It was a bit like comparing AAA cells with AA! The rest of our system remains the same except for the regulator. I decided to upgrade the regulator to one which provides more parameters in ensuring a better and more comprehensive set of measures of battery performance.